Research has shown that persuasive strategies are more effective when personalized to an individual or group of similar individuals. 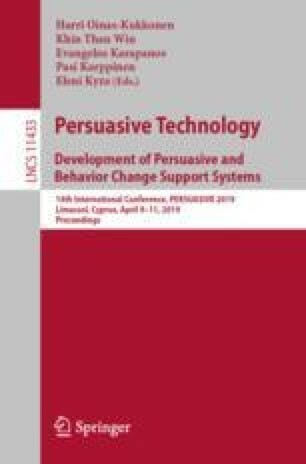 However, there is little knowledge of how the value derived from consumers’ online shopping can be used for group-based tailoring of persuasive strategies. To contribute to research in this area, we conducted a study of 244 e-commerce shoppers to investigate how the value they derive from shopping online (hedonic or utilitarian value) can be used to tailor the persuasive strategies: reciprocation, commitment and consistency, social proof, liking, authority and scarcity. In addition, we investigate the susceptibility of the participants to these strategies based on their gender. Our results suggest that people that derive hedonic shopping value online are influenced by scarcity, while those that derive utilitarian shopping value are influenced by consensus. In addition, male shoppers who derive hedonic value from online shopping are influenced by commitment. The results presented here can inform e-commerce developers and stakeholders on how to tailor influence strategies to consumers based on the value the consumers derive from online shopping.